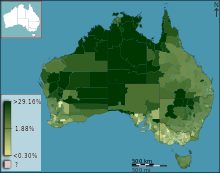 The demography of Australia covers basic statistics, most populous cities, ethnicity and religion. 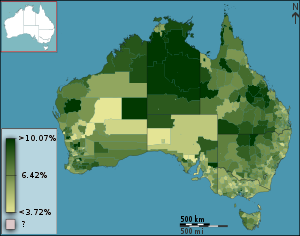 The population of Australia is estimated to be 25,336,000 as of 24 April 2019. Australia is the 52nd most populous country in the world and the most populous Oceanian country. Its population is concentrated mainly in urban areas and is expected to exceed 28 million by 2030. 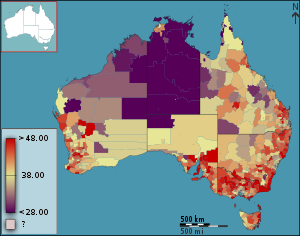 Australian babies: 0 year olds as a fraction of total persons, in Australia, according to the 2011 census results. 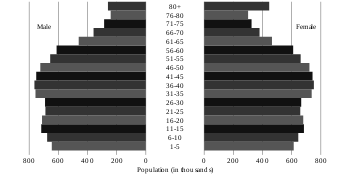 This page was last edited on 24 April 2019, at 10:59 (UTC).